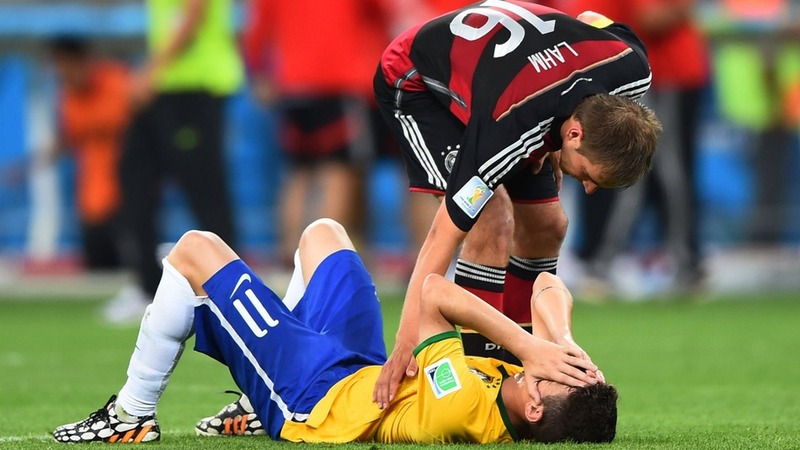 » 7-1: GERMANY SLAUGHTER BRAZIL! A COUNTRY IN SHOCK! Brazil 2014 7-1: GERMANY SLAUGHTER BRAZIL! A COUNTRY IN SHOCK! Madness! Anger, joy at one side, humiliation at the other, and a huge disappointment…. The whole Brazil hoped to see the Selecao win against Germany last night! Brazil was humiliated on the score 7 goals to 1! Yes, 7 goals to 1!! A historic score for the semifinals of a World Cup football!! No one, probably nobody even among the wildest punters have bet a ticket on this historic score! 11th T.Müller, 23rd M.Klose, 24th T.Kroos; 26th T.Kroos, 29th S.Khedira. In the second half time A.Schürrle aggravated the scoring in the 69th minute, and a brace in the 79th! Brazil has managed to “save the honor” by OScar in the 90th. What cold water on the lawn of the Estadio Mineirão Belo Horizonte and across the country. The night may be animated in Brazil. Hope that anger does not take precedence over the huge disappointment! The riot police were deployed around the stadium before the final whistle. Miroslav Klose signing his fifteenth goal in the World Cup became the historical best scorer of the competition before Ronaldo! The German striker is 36 years old. He had scored five in 2002, five in 2006, four in 2010 and now two in 2014. He also became the only player to appear in four semifinals of World Cup in his career.